"Typhoid Mary" - Villainized & Victimized ! 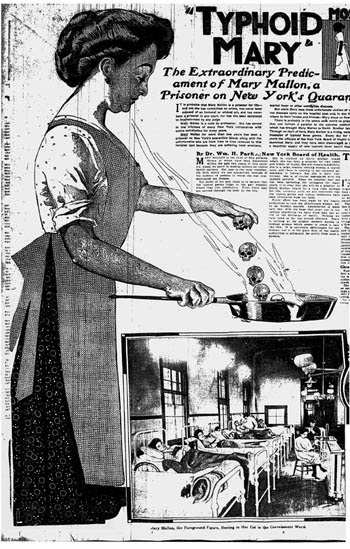 Mary Mallon, an Irish girl in her teen age moved to the United States to cook for the wealthy. She was a wonderful cook and would have enjoyed her reputation, had it not been for a small typhoid outbreak during the 1906 summer. With the local officials ruling out contamination of food or water as sources, George Soper, a famous sanitary engineer was roped in to determine the cause of outbreak. Based on investigations and through elimination processes, Soper narrowed down to the cook, who had mysteriously left about 3 weeks after the first case of outbreak. He continued the search for the lady and his investigations opened up several cases of outbreaks during the past 10 years, causing about 28 cases and that each time, after the outbreak, the cook seemed to have left. He strongly suspected that she was a carrier who never fell ill, but was the source of microorganisms. After lots of efforts and leads, Soper managed to meet Mary in March 1907, who was working for a family with a false name and the family had a typhoid outbreak. Mary did not cooperate with Soper when she was told that she was suspected to be a carrier of typhoid and asked to be tested. She chased him away with a fork and his further attempts to have her tested failed too. Soper had to call in the authorities and she was forcefully taken to a hospital and tests revealed her stools teeming with typhoid bacilli. However, fearing for life, she refused to have gall bladder surgery to eliminate the bacilli. Having deemed too infectious to live among public, she was sent to an isolated facility where she lived alone. About 163 samples from her were regularly tested between 1907 and 1909, and though several turned to be negative since she was on treatment, health authorities insisted that she should be isolated. Mary went to court and her lawyer filed a writ of habeas corpus. Interestingly it is believed that, since her case made interesting and sensational news, the newspapers had paid legal fees to get hold of the story. Mary became famous overnight and went on to garner empathy out of public sentiments. In 1910, the New York City health commissioner decided to release her under a condition that she should never work as a cook again. Again, it was a promise that Mary could not keep. She enrolled as a cook in a hospital in New York assuming a false name and again several people including doctors and nurses acquired typhoid and 8 died. With that, her official total was 51 sickened and several dead, but there are no exact figures available since she worked under several false names for many years. Mary was again taken into custody and sent back in to exile. Still she refused the surgery and swore never to change her profession, leading to extension of her isolation in a hospital room. Eventually, age took its toll and Mary died in 1938 from the effects of a stroke. Upon her autopsy, the pathologist diagnosed evidence of live typhoid bacilli in her gall bladder. Very interestingly, in a recent study published in the journal Cell Host and Microbe in August 2013, scientists were able to solve the mystery of how a pathogenic bacterium can, in some people, manage to persist without causing symptoms and find a way to survive for decades. Salmonella, the bacteria causing typhoid, manage to hide in the macrophages and hack their metabolism to their own benefit. The researchers have found that a protein - PPAR-delta was required for Salmonella to replicate inside the macrophages and hack them. Thus, if the bacterium is successful, then an infected person continues to spread the pathogen unknowingly and without falling ill or exhibiting any symptoms, as in the case of 'Typhoid Mary'. Thus, to sum up, the life history of ‘Typhoid Mary’ goes on to reflect on how callously those deemed to be contagious threat to public, were handled by public health officials, those days, and how painful it would have been to Mary in her perspective, of forced isolated for about three decades. However, 'Typhoid Mary' will remain immortal for, her very name invoking a personification of an outbreak and highlighting the importance of personal hygiene and screening of those who handle food. 4. Eisele NA, Ruby T, Jacobson A, Manzanillo PS, Cox JS, Lam L, et al. Salmonella Require the Fatty Acid Regulator PPARδ for the Establishment of a Metabolic Environment Essential for Long-Term Persistence. Cell Host & Microbe. 2013 Aug 14;14(2):171–82. 5. Pommerville JC, Alcamo’s Fundamentals of Microbiology, 10th edition, First Indian edition, 2014, Jones and Bartlett India, New Delhi.